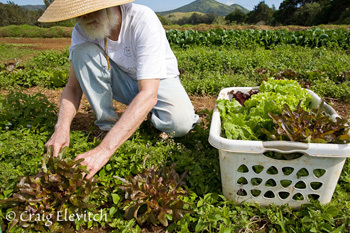 Ken Hufford harvests lettuce at Honopua Farm, Waimea. What is the Hawai'i Homegrown Food Network? The Hawai'i Homegrown Food Network is composed of people with a passion for local and sustainable food on the island of Hawai'i. They grow food or want to learn more about how to grow food, and many just like to eat fresh, locally grown food. Some sell, buy, distribute, or provide support for the sustainably-grown food system. Some are working to feed those in our community who are in need. The HawaiiHomegrown.net website is the network's information, educational and marketing hub, providing individuals and organizations on Hawai'i Island with vital resources and interactive tools to further cultivate their sustainable food communities. Why "Homegrown"? Why not just "Hawai'i Food Network"? Hawai'i Island currently has a food economy based upon petroleum-fueled agriculture and long-distance transportation. We import about 85% of our food from the U.S. mainland and other countries. First, it means food grown at one's home, where one lives. This is the freshest food and the strongest basis for personal and community food security because it is self-reliant and does not require petroleum-fueled transportation systems. Second, this island is our home. Anything that can be grown in the State of Hawai'i can be grown here. But some foods grown on windward side don't grow well on leeward side, and vice-versa. Some foods grow better makai than mauka. So the foods you and I can't grow where we live can be bought (or bartered) from someone growing it somewhere else on our island. 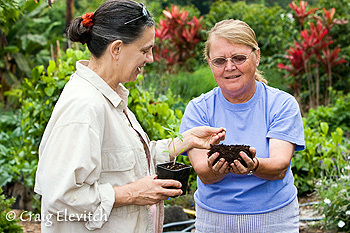 This provides Hawai'i Island "homegrown" food self-reliance. Finally, it means grown without imported chemical fertilizers and pesticides. It means using "homegrown" resources found on this island and recycled from the natural environment in order to build healthy soils and produce healthy fresh food. We believe that sustainability starts with homegrown. 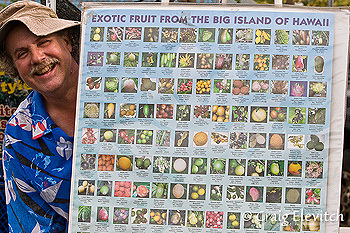 Ken Love shows his popular fruit poster. What is unique about the Hawaii Homegrown Food Network? There are many groups on Hawai'i Island supporting a local and sustainable food economy (see for example, our Supporting Organizations). There are hundreds of farms and growers, and scores of wholesalers and retailers. Many of these stakeholders have been unaware of each other's existence, activities, knowledge, background, and community roles. The Hawai'i Homegrown Food Network creates a place for these stakeholders to meet each other and work together, unified in a common purpose: the reduction in imported, petroleum-dependent foods and farm inputs, and the growth of our local, sustainable food community. How can I benefit from the Network? The HHFN website provides educational information and many resources for the site visitor, including an up-to-date calendar of events, featuring local agriculture and food workshops, classes and conference events; sustainable agriculture website links; CSA's and community gardens; farmers market links; books and publication reviews; reports of recent local food events; and announcements from members about products, services, and events. Join the Hawai'i Homegrown Food Network! Members can post new events and announcements, can contribute reports, and can interact with other members with marketing inquiries, comments, ideas and questions. 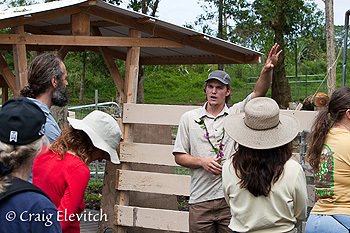 Britton leads a tour at Milk & Honey Farm, Pahoa. How can I help with local and sustainable food security on Hawaii Island? Here are a few suggestions. If you don't yet have food growing where you live, you might want to find out more about annual and perennial gardens. Even if you don't have a yard, you can grow a large portion of your fresh food in containers in a very small area, such as a lanai. See Resources. You can also look to join a community garden. What you're not growing yourself, buy "locally-grown" at a nearby farmers market or natural food store or participate in Community Supported Agriculture (CSA). Learn to appreciate foods that were grown throughout Polynesia and grown and eaten locally by Hawaiians. Learn to save seeds. 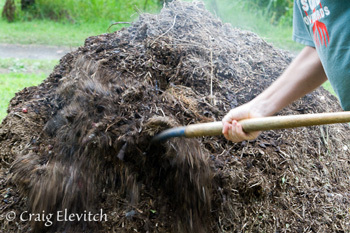 Learn how to compost, mulch, and conserve water. Volunteer to help out with local or school gardening projects and grassroots groups in your district promoting sustainably grown food. When eating out, be sure to frequent restaurants that serve local and sustainably grown food. I'm confused about the terms "local," "sustainable," "organic," "unsprayed," etc. Help! Conventional: These food crops or products are grown using petroleum-based chemical pesticides, herbicides and/or fertilizers. These crops and products may be grown locally or imported. In Hawai'i, all of the pesticides and fertilizers are imported. Conventional growing is not sustainable since it has many external costs we will eventually have to pay for such as high CO2 emissions per food calorie grown, soil erosion, and pollution of soil and water with chemicals. Local: We take this to mean grown on Hawai'i Island. Others may have narrower definitions, such as grown in one's neighborhood, ahupua'a (traditional Hawaiian land division), or district. Locally grown food crops and products may be conventional, certified organic, organic, no-spray, sustainable, or some combination. Just because it's local does not mean it's sustainable. Certified Organic: These food crops and products are legally certified by a US Department of Agriculture accredited certifying agency as having been produced with strict organic practices. In Hawai'i the main accredited certifying agency is the Hawai'i Organic Farmers Association (HOFA ). Certified Organic food products are grown or produced on Hawai'i Island, and they are also imported from the mainland and internationally. Just because it's organic does not mean it's sustainable. Ben Discoe turns compost at his farm in Ahualoa. Organic but not certified: Some small local farms with sales less that $5,000/year follow strict organic practices but choose (usually because of costs) not to be certified. They must be approved by HOFA, and they have the legal right to call their food products "Organic," but not "Certified Organic." Organic: You may see produce and especially fertilizers that use the word "Organic," but are not really certified or do not follow strict organic practices. Most of these are illegal, and some agribusiness companies have found legal loopholes. Buyer beware! Such produce is usually locally grown, but the fertilizers are imported from all over the world. Look very closely for the Certified Organic label. "UnSprayed" or "No Spray": You may see this tag in the produce section of your retail food outlet. It implies that the food crop was grown without pesticides, herbicides or chemical fertilizers. It is best to check with the produce manager of the store, or better yet find out which farm the produce came from and learn what growing practices that farm uses. Just because it's "No-Spray" does not mean it's sustainable. Sustainable: Food crops and products that are grown sustainably must be locally-produced, using organic practices, without imported soil amendments, fertilizers, or pesticides, whether petroleum-based or Certified Organic. To grow our food in a truly sustainable manner we can learn the principles and practices of permaculture systems, biodynamic systems or pre-contact Polynesian growing systems, in which the nutritive and biotic resources of the land are constantly recycled and replenished. Margaret Krimm shows Julia Rosekrans how healthy compost smells and feels. I would like to post an announcement, but I'm not a Member. Why do I have to become a Member? By becoming a member you ensure that you are a real person and not an automated computer posted distracting messages. That makes our lives easier as site administrators. Moreover, joining the Network is a way of supporting your local food community by saying, "Yes, I'm in!" even if that is the full extent of your participation.